Green Light!! Norris and Kubica led the way for the first session of the 2019 season with Russell not far behind. Just as Ferrari were dawdling out of the garage with a set of Mediums, Norris hit the line for a 1:24.654 followed by Russell and Kubica, already well off the pace. 12 minutes left and the lackadaisical atmosphere continued with only half the field out and circulating. Leclerc was ahead of him, though and rocked briefly up to the top, nearly half a second up and then Kvyat was by, 0.013 up on the Ferrari neophyte, who was trailed by Giovinazzi and Raikkonen. .
9 minutes to go and the Mercedes were out and unlike FP3, not well clear, with Bottas taking top honours in a 1:22.658. Perez then became the midfielder to notice as he went P4 and just 0.227 off the Mercedes. Vettel took advantage to improve to P3, but his teammate languished in P12 as HAAS took to the circuit. It was a good lap for Grosjean, up to P5 and just behind Perez, but Magnussen had a mistake and ran wide and with just 2 minutes left, he was in the drop zone, followed by Stroll, Albon, Russell and Kubica. 1 minute to go and it was go time for Stroll, and up to P8, but not for long as hulkenberg and Raikkonen both outpointed him. Giovinazzi was next and up to P4 he went and then it was Charles Leclerc, with a new set of Softs, to the top. Kmag ws up to P6 and in the ensuing confusion it was Stroll, who initially looked to have been safe, who wound up P16 and out, followed by Gasly, Sainz, Russell and Kubica, who suffered a puncture in addition to the indignity of having to wrestle the Williams abou the track. Off to the barbie they went as the rest turned themselves around for Q2. Q2 was led by both Ferraris and Hamilton, with Vettel this time sensibly sporting the Soft tyre. Hamilton was first across the line with a 1:21.861 and Vettel slotted in neatly behind him, with Leclerc just ahead. 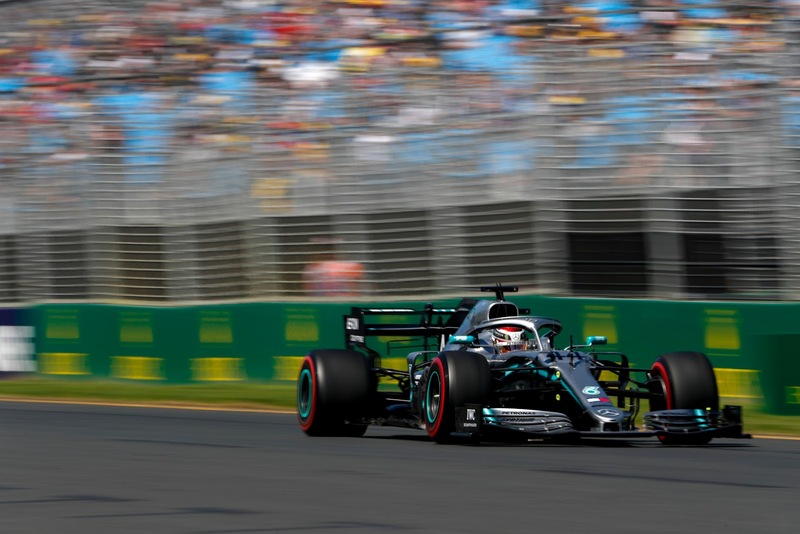 Lewis had run wide, having come upon traffic near the end of his lap but fortunately batting clean up was Bottas, who had a flawless go and rocked up to P1 with a 1:21.241. 8 minutes to go and it was Kmag, up to P6 with his first run, with Grosjean having ruined his first run with a mistake in the hairpin, losing the back and being forced to give it another go. With Gasly having gone out in the first session it was left to Verstappen to raise the flag for Red Bull, and he did so with aplomb, taking P2 just 0.471s off the Mercedes. 5 minutes to go and it was just Verstappen rolling home, as the rest of the field was already in the pits getting ready for their last run at the glory of Q3. On the outside looking in were Grosjean, Kvyat, Albon, Giovinazzi and Norris. Hardly glory days for McLaren with Sainz gone out having been trapped in the aftermath of Kubica's puncture. Kmag was one of the first on it, and Hamilton, not far behind was clearly putting in a fast lap. P6 for Magnussen, then P5 for Grosjean as Hamilton went to the top, with a new lap record of 1:21.014. Norris got the job done as well, up to P9 and then it was Ricciardo, unable to get the job done, 0.008s off Hulkenberg in P10. At least until Perez got around to sticking the knife in deep and kicking Hulkenberg to the kerb. Thus it was that Hulkenberg, Ricciardo, Albon, Giovinazzi and Kvyat were off in search of some Bundaberg to drown their sorrows. The rest turned it around to chase the ultimate palmares of Q3. Q3 was led by the pair of HAAS Grosjean ahead of K-Mag, until the Mercedes duo smashed through, Hamilton with a 1:21.055 and then Bottas, with a superior 1:20.598, 0.6s up on the best that Vettel could deliver. Leclerc slotted behind him and it was Verstappen just eensing into P5 with a bit of a sloppy effort and Norris into P8. Raikkonen and Hulkenberg sat out the first round, and as everyone rolled into the pits for new tyres and last minute tweaks, the anticipation of the final showdown hung heavily in the air. 3 minutes to go, and it was into a line of traffic the Mercedes departed. Hanging back were the Ferraris, tailed only by Raikkonen, with Leclerc leading Vettel this time round. Verstappen was very late to the party, rolling out with nary a minute and a half to the checquers, barely time to get round and have a go. Hamilton was on it, purple mini sectors lighting up across his lap, but still off halfway through. Bottas was nowhere near fast enough on round 2 and it was a squeaker, with Lewis just pipping Bottas by a tenth when all was said and done. Neither Ferrari was even in the neighborhood and then it was just Max, howling around the track and then crashing into the all red 2nd row, ahead of Leclerc when the dust settled. Dismal news for fans of the Scuderia, 0.7s down despite their best efforts, overlooking that Melbourne is always a bit of a one off, and of course that points are handed out on the morrow. Fantastic news for Red Bull, in between the Prancing Horses at the first race seems a big improvement, but given the distance to the Mercedes one wonders whether it's more a case of Ferrari stooping to their level than vice versa.